I've got a great review and giveaway today courtesy of Drumond Park. 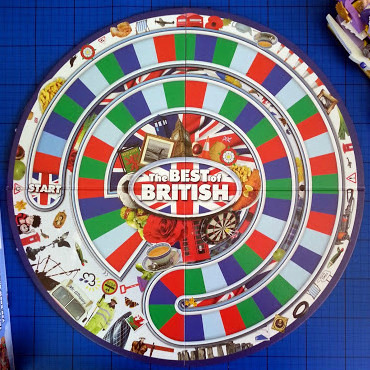 LOGO: Best Of British is a real 'you know it or you don't' kind of board game. General knowledge rules and you'll find you are kicking yourself all night about answers that were on the tip of your tongue. Best Of British is from the LOGO family of games and can be played as individuals or teams. 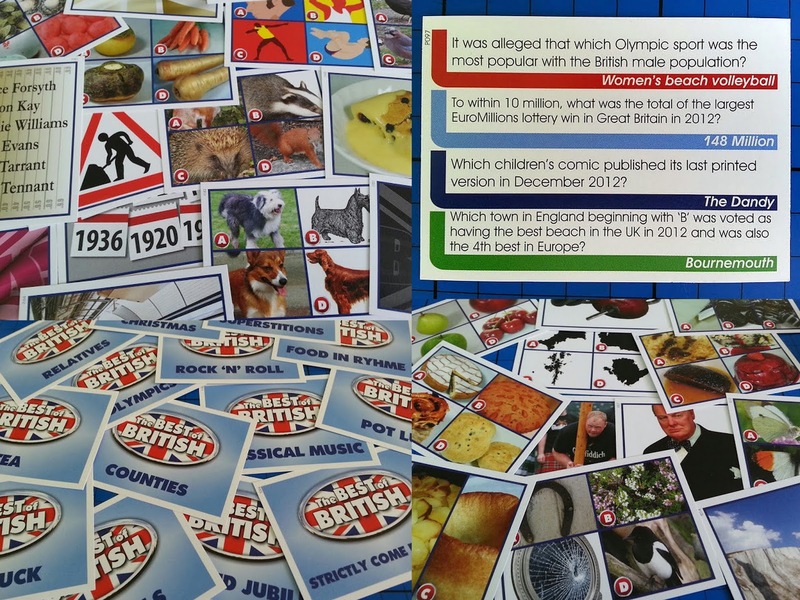 It has some very tricky general knowledge questions, so is recommended for young people and adults aged 12+. 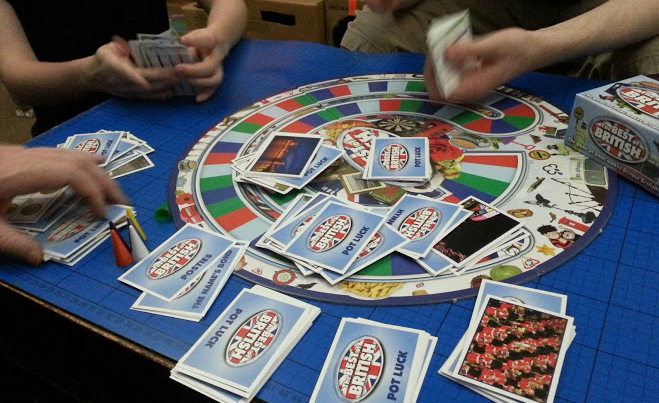 The regular LOGO board game and question card style is very familiar to us because we've played and reviewed several LOGO games over the past couple of years. There are 3 kinds of question cards - Picture Cards, Common Theme Cards and Pot Luck Cards - which you will need to shuffle well before you play for the first time (this takes a while as there are 400). Each player in the individual game chooses a counter and works their way from the start square to the end - first to the end is the winner. You travel around the board by answering the questions on the cards correctly. 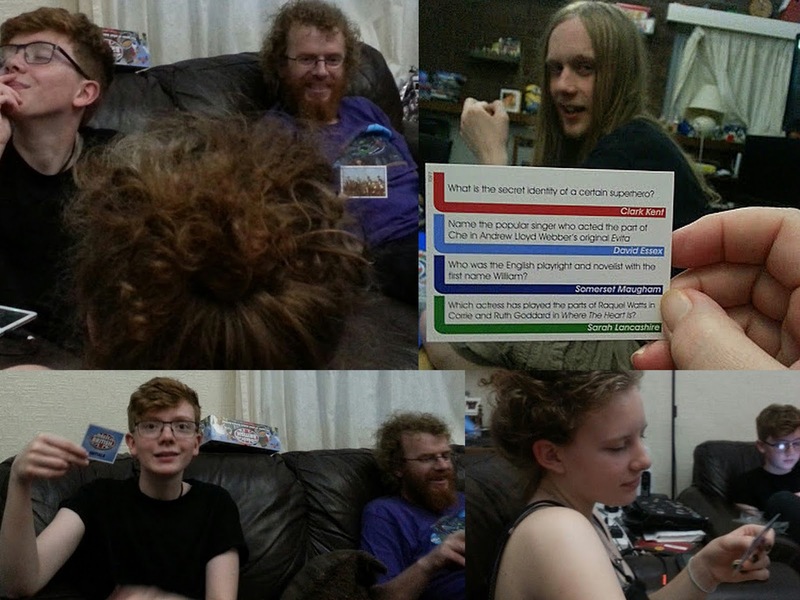 Each round one player asks each of the questions on the card in turn, to each of the other players in turn starting with the player to their left, and the person who first answers correctly moves forward to the corresponding colour square. The player who reaches the centre of the board and answers a green question correctly first is the winner. For team play split into 2 teams and definitely make sure you have a good mix of ages - we found the adults get a very clear advantage over teenagers and young people with Best Of British (yeeay!). Take it in turns to be Question Master for your team and conceal the answers from all other players. The Question Master then asks the questions on the card in order to the opposing team members first, and whenever they answer incorrectly the question can then be offered to their own team as a bonus. 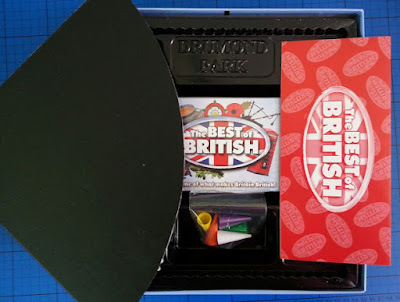 The teams take it in turns to pick a fresh card from the box, and the team who reach the centre of the board first and correctly answer a green question are the winners. 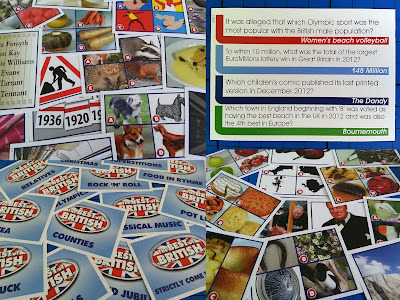 The 2012 update to this game (which we were sent), added quite a few news stories from that year - including covering the London Olympics and Diamond Jubilee. Most of this will be remembered, but there is always a danger with topical subjects that they will become dated and I think as time goes on some of the 2012 questions might seem a bit of a strange inclusion. There was one about a Scottish Independence vote - which, in 2015, anyone would think referred to the recent referendum, but in fact was about the ministerial vote on whether to hold a referendum. In 2012 it was huge news, but became a mere formality once the actual referendum took place. 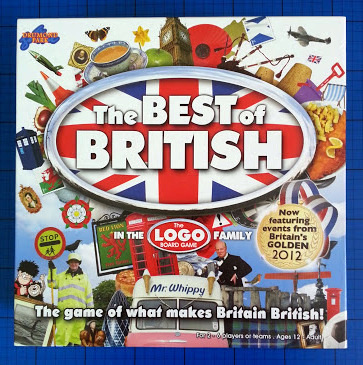 LOGO Best Of British is an excellent game full of umbrellas and fish & chips, Wimbledon, Snowdon and The Beatles. Most preferred by the adults in our household, excellent to play as a family in teams with mixed age groups, a brilliant laugh and we all learnt a lot! 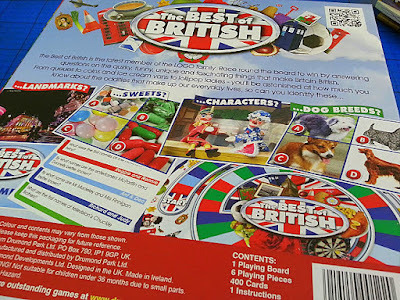 LOGO Best Of British has a recommended retail price of £29.99 and it really does make an excellent gift for a more grown up evening of entertainment. 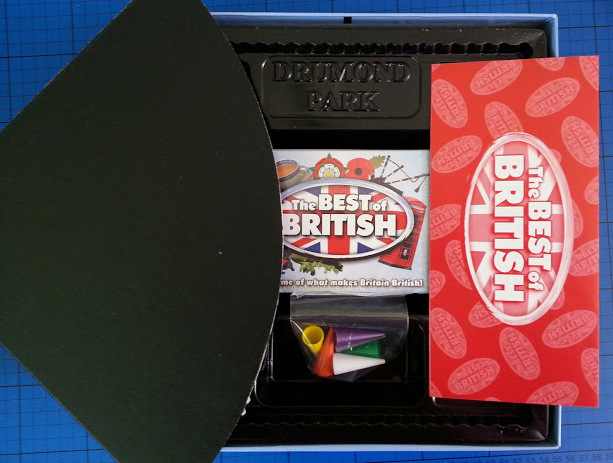 Drumond Park have very kindly offered a copy of LOGO Best Of British as a prize for one of my readers. Entry is by Gleam form below and the giveaway will end at midnight Friday 31st July. UK entries only, please see further terms and conditions at the bottom of the Gleam form. The medias reaction to weather predictions! They always go over the top making us (the public) think the whole country is about to become to a standstill because snow is forecast. In other countries, where they get even colder temps and deeper snow, always cope well. But us British rush to the shops to buy enought food to last us a month if we are snowed in! Queues. My biggest gripe when I'm abroad is people not knowing how to queue. Talking about the weather always amuses me. Yet, it's a lovely way to be involved in a harmless conversation! The fact that we as British people feel that we have to apologise for every little thing in case we offend anyone - we as so muhc as nudge someone in a supermarket we have to apologise 20 times! Love the British charm of it! Fish and chips because they taste so good. the cold weather and people moaning it costs a lot to heat the house. I remember having no heating in our house, we just had extra clothing on. husband always says they used to have ice on the inside of their windows. A Devon cream tea for sure!! Fish and chips and cream teas! How you can't begin any task whatsoever before you've had a cup of tea. Going to the seaside and watching Punch and Judy whilst eating some delicious Fish and Chips.... can't beat it! The fact that our nation's favourite food is Indian or Chinese! I also love the obsession with the weather! I love the British trait of sitting in a traffic queue every Bank Holiday, wishing we hadn't bothered and swearing we won't do this again! the British sense of humour, we are the masters of irony and satire! British humour,best in the world! Our self depreciation ...The fact that we are always ready to take the micky out ourselves...its brilliant ...I don't think any other nation does it as well! Chatting over the garden fence about the weather. Always complaining about the weather! I work with a Polish guy and I've made him honorary British because he's started do it too! I love the British countryside, we have so much to offer - miss the grass and fields if in a hot dry country so by default I like the rain!! How you have hot tea even when it's sweltering out. I've grown up with iced tea, so it's strange to me. Its got to be queueing, we are obsessed with it! Our humour! Not everyone gets it.. but I think we're hilarious. Our reservedness - It makes me smile on the bus when outgoing Southern Europeans are on the bus and the Brits talk in low whispers tutting. Afternoon tea, cake and tea makes me smile a lot! Talking to anyone about the weather!! Fish and chips on the beach is just the best! Fish, Chips and Curry sauce! Our eclectic dress sense, the British truly have a style all its own. Our very dry sense of humor. Confuses alot of the other nationalities. Standing in a queue when there is no need to. And saying sorry for things which aren't your fault. Fish and Chips with a mug of tea! Our obsession with the weather,we even call across a street to a stranger"nice/cold/beautiful day"Why do we do this?,it's not as if they don't know what the weather is doing.It makes me smile as it's such a British thing to do and when else would you talk to strangers,oh,I forgot,don't do it in London,they either ignore you or look at you in a rather odd sort of way ! Cold trips to the seaside eating fish and chips wrapped in towels! The British weather and the amount of moaning we do if its too hot or too wet. What makes me smile is seeing everyone fighting to fill up their shopping trolley when snow has been forecast, must get milk and bread you never know when the shops will be open again haha and normally its the next day. How obsessive we are with the weather, it's all we talk about! When we apologise to someone for something they did! Like when someone bumps into you & you both say sorry! Doing outside activities even when the weather is atrocious is very British and shows great spirit! That we ALWAYS say sorry! Moaning about The Great British Weather!